You've fixed the one thing that's putting me off buying the Edge, thanks. If I do this and Samsung release an update, can they reverse it all? If so, that'll make the phone unusable, yes? It'll need a factory reset? 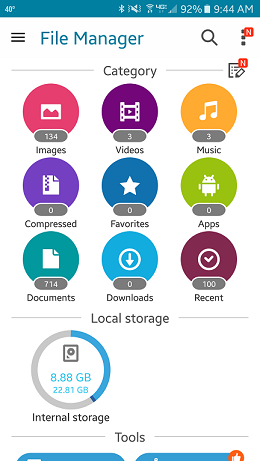 I have some apps already moved to SD Card. Do I need to move them Back or it's enough to just copy content of the card to PC before making SD 50/50? Also - How can I find all apps which were moved to SD? you need to move them back as far as I know. Shows up fine on the phone but the "new" internal storage doesnt show up when connected to the PC? Any way around this? Looks like it is working for all of you. I activated the debugging usb in the phone. i open prompt command. I type "adb shell"
then i get the error: device "null" not found. What to do when getting stuck on this first step? i am using either windows 8 or 10. Could someone please point out the source of my idiocy? I did this the first time also. When you connect the phone to usb, in the "Use USB for" menu select "Software Installation" not "Transferring media files". If you choose "transferring media files", adb shell will still connect, but it gives that error. 1. use internal/external as one. 2. if I cant, would i be fine with all pics/vids on the sd card but some (not all move over to sd card) and use just the 32GB internal memory? 3. Return and just get the Nexus 6P? So, "adb shell sm set-force-adoptable true" doesn't work? It works on the Nexus 5X/6P with an OTG drive. No, that command basically makes normally unadoptable devices - like OTG - adoptable. Not quite the same thing. I did everything according the guide, but most of the app still install on real internal memory, only some app will install on the adoptable storage. 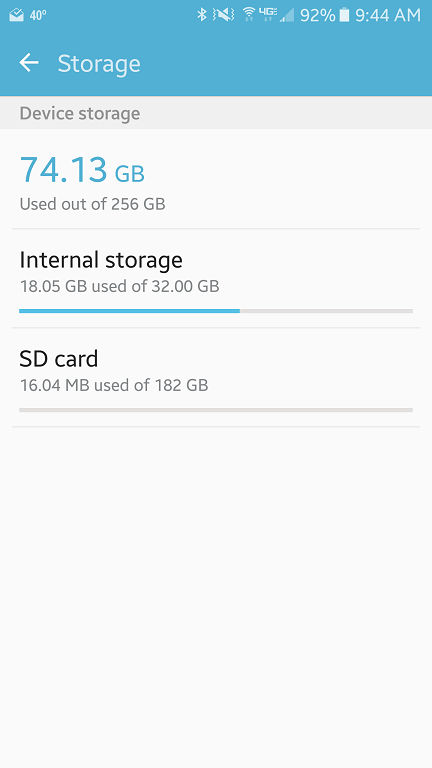 Is it up to the app developer to make the adjustment to save on external storage? MUCH appreciated! Now I am truly happy with this phone. I had the same issue as Brownstone1892 already told by getting the notification of "Binder_B gave up waiting for partitionPrivate after 180000ms". I tried to partition the sd card with public and mixed mode and this is running. But looking into sd card in system configuration the sd card cannot be read before formating. After formating it's the same situation as before of having splitted internal and external storage. Very cool, but I think I may have done something wrong. I ran through the steps and it seemed to work fine. However, I don't see my SD card anymore at all in any file manager app, or when Im connected to my computer. I do see an SDCard in FreeSpace (as having the same attributes/size as my Internal/data) but not the external cars. I do see it as part of the device storage on the normal Settings/Storage screen, and it shows about the right amount of storage. Does this matter? Should I care that I cant see it when its connected to my computer anymore? Am I going to be able to transfer files (like music or videos) that are collectively larger than my "internal" storage shows? Thanks for this. I too have the UK Exynos version and it works perfectly (My disk was 179,0 as well). I then went to Storage> SD Card> More> Migrate your data and it worked perfectly. PC Now reads as SDcard = 0mb, Phone 118 MB! That'll do. 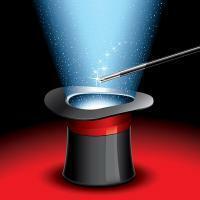 i am trying to use parallels on my mac to do this. every time i enter the first prompt in windows 10 it says " "sm" is not recognized as an internal or external command, operable program or batch file." So I filled up internal storage after doing this as a test. The phone complained about storage and some things wouldn't open (camera). Also Google play wouldn't download movies to the adaptable storage either. Apps did install to the card after internal storage was full though so it works in part. Unless I can find a workaround I'll split the SD card so Google Play and the camera app will see a SD card and download things there. Hopefully a mix will give me some flexability. 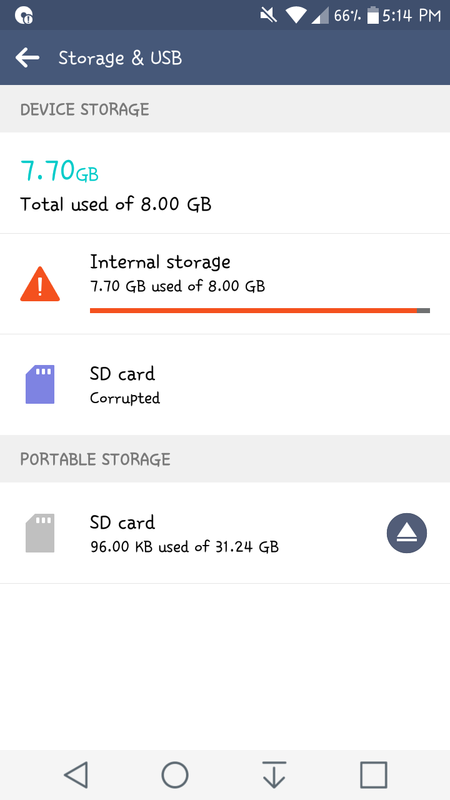 Hi quick question if anyone can answer, so it seems like this worked correctly as im seeing the internal storage is in MB and the reminder of mt storage is on the SD card, Now i have a 128gb sd card and the 32gb internal storage, when looking at the amalgamation of the two i only see a total of around 128gbs. Where did the additional 32 gbs go ? Like PopUser and Pertinax, on my Snapdragon (Verizon) S7 Edge this does not really work. My phone's Storage screen looks like Pertinax's. When I connect the phone to my PC via USB in MTP mode, it shows only the same 22GB total capacity it always shows for internal storage (it apparently doesn't count the ~10 GB of stuff that comes pre-loaded on the phone that can't be deleted). And when I create a new folder on the phone and copy a few gigs of music files into it, those files get copied onto internal storage, not the adopted SD card storage. Using the Storage Analyzer app (see attached screenshot), I can select my SD card (it wasn't automatically shown by the app, but I was able to find it under "Where's my SD Card?" as "mnt/expand/9770696d0112304940-9643-3103187eb8e3") and it shows as having a total capacity of 181.88GB, with 40K used (0%)...even after trying to copy over a bunch of music. If adoptable storage is supposed to "just work" as one big ol' storage pool...well, this ain't working like that. I can't get past 'adb shell' is not recognized as an internal or external command, operable program or batch file. My grandson is killin me with all these VR downloads. I have a 200gb sd card. But as stated above, I can't seem to get it to work for me. If ya get a chance, any suggestions would be greatly appreciated! I set mine as all private but like one of users stated earlier that photo, video, movies, music files, even app downloaded after setting this adoptable storage, they're all went to internal storage. I still have to manually move the app to external storage for those that can be moved. 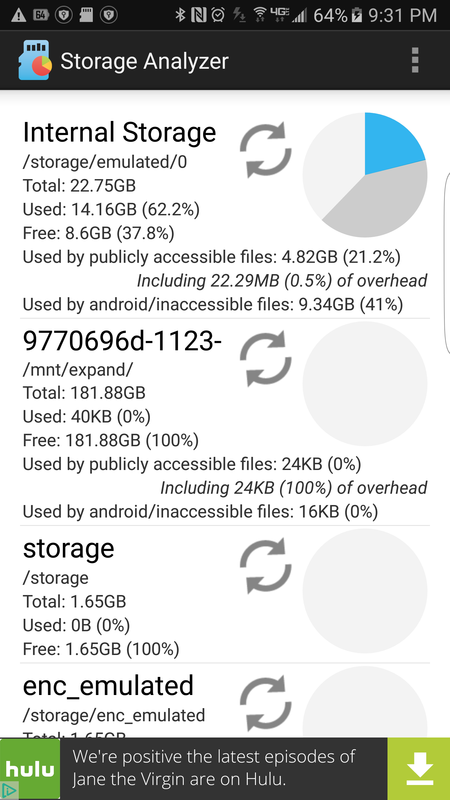 So is this adoptable storage really works? I thought it supposed to install apps, photo, video, etc to the partition that has more storage, which doesn't look like it's doing it though. Even with the Oculus Gear VR installation, all the games or VR related content were downloaded to internal storage. 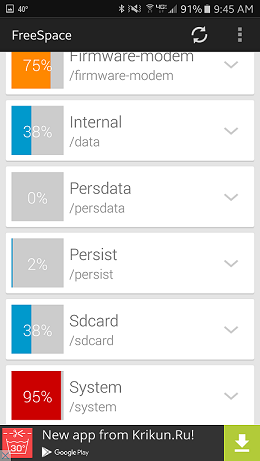 After formatting the microSD card go into storage highlight the SD card and hit menu and migrate data. This moves everything to the sd card and everything in the future installs to the SD card until it is full and then moves to internal. I keep running into this issue. I'm following all the steps is there something I'm doing wrong? I purchased an S7 Dual SIM from Singapore last wekkend and did the SIM card modification to allow both SIMs and the Storage card to be inserted. I have this morning followed the instructions for Adoptive Storage and it seems to have worked, however every time I try to copy files from my PC back to the storage the process fails after a few seconds saying that the device has been disconnected or is no longer available. When i executed the 'sm list-disks' mine came back as '179,0' So i issued the command as 'sm partition disk 179,0 private' was that correct? EDIT2: FIXED: I just had to follow Captain Nellies advise given in the post above about migrating the data and then all works as expected and now i can copy files to my larger Internal (Adaptive) memory location. Error: java.lang.IllegalArgumentException: command '225 volume partition disk:179:160 private' failed with '500 225 Unknown disk' I'm getting this error when I put in the last command..... Please Help!